How I use my iPhone to charge all my other batteries. Wait. What? Want to hear a funny story? Not too long ago, I drove 4 hours to a last-minute, geographically isolated, commercial shoot with an SUV full of professional camera and audio equipment, only to discover that most of my gear’s rechargeable batteries were nearly dead! Oh wait, I meant “a horrible story,” not “a funny story.” Thanks to a very resourceful gaffer, I survived the day (and the shoot), but vowed never to be surprised by another dead battery. I set out to find a solution that would allow ALL of my batteries to be fully charged on short notice, but would not require them to be charging at all times. Turns out, the solution was deceptively simple, and required my iPhone– NERD BONUS! First, I made sure each of my batteries was in its own charger (I picked up a few low-cost chargers from eBay), then plugged them all into three power strips (Accell’s Powramid Surge Protectors do a nice job of accommodating multiple oversized plugs). I plugged those power strips into a single extension cord that was, in turn, plugged into a WeMo — that’s where the magic happens. What’s a WeMo? Belkin’s WeMo Switch is a Wi-Fi enabled, internet-connected power outlet that can be controlled from anywhere using its partner app on a smartphone or tablet. It’s like having a portable on/off switch in your pocket. 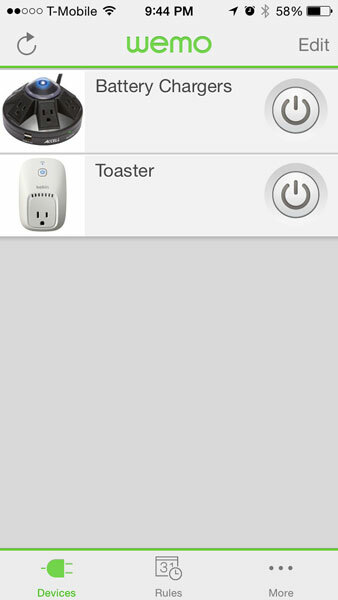 Now, when I’m away at a meeting, and find out that I’ll be shooting the next day, I reach for my iPhone, tap the virtual power button inside the WeMo app — remotely turning on my WeMo Switch, and instantly begin charging my batteries at home! If you want to take your WeMo setup to the next level, check out If This Then That, a remarkable automation tool that interconnects your existing online accounts and compatible hardware. With some clever scripting, I’m guessing you could have your batteries automatically begin charging the moment you get an email from a specific client, or when someone tweets a particular hashtag, etc. Nerdrific! On a side note, I once used a WeMo switch to remotely turn on a light inside a building while shooting a nighttime exterior. It was a tiny crew, and we didn’t have a spare person to control the light, so I used the WeMo app on my iPhone, and powered up the light from outside. It wasn’t a perfect solution, and the timing took a little practice, but it worked! While the WeMo Switch was originally designed for basic home automation (i.e., turning on the toaster oven from bed), it’s become a powerful addition to my filmmaking bag of tricks… While also turning on my toaster from bed. What? Who doesn’t like toast?